Ohrid is a city in Republic of Macedonia, notable for once having had 365 churches, one for each day of the year, and has been referred to as a “Jerusalem (of the Balkans)”. The city is rich in picturesque houses and monuments and the tourism is predominant. It is located about 170 km southwest of Skopje at an elevation of 695 meters above the sea level. 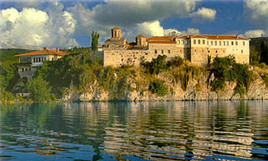 In 1979 and in 1980, Ohrid and Lake Ohrid were accepted as Cultural and Natural World heretage Cities by UNESCO. 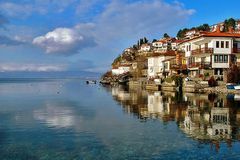 In fact, Ohrid is one of only 28 sites that are part of UNESCO’s World Heritage that are both Cultural and Natural sites. Ohrid has a humid subtropical climate. The coldest month is January with an average temperature range between −1.5 °C (29.3 °F) and 6.2 °C (43.2 °F). The warmest month is August with average temperature range of 14.2 °C (57.6 °F) and 27.7 °C (82 °F). The rainiest month is November, which sees on average 90.5 mm (3.6 in) of rain. The summer months of June, July and August receive the least amount of rain, around 30 mm (1.2 in). The best time to visit Ohrid will be when the average temperatures are at a comfortable level (between 20°C / 68.0°F and 30°C / 86.0°F on average) which is during months June, July and August. Other great months to visit Ohrid are May, September and October when the average temperatures are a little cooler but still between a pleasant 10°C (50.0°F) and 20°C (68.0°F). 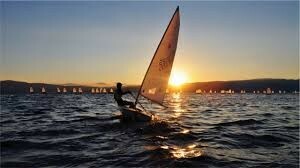 Lake Ohrid rightly deserves the name “Macedonia’s freshwater sea”. Not only for its warm water blue colour, which gains its intensity from the sky blue colour, but because of its size, this lake gives an impression of being a sea. It covers an area of 358 square kilometers and one gets an impression of being in front of a large bay of the sea as if a part had been uprooted of the sea’s breadth, and launched among high mountains 695 meters above sea level. On its northern shore the ancient city of Ohrid, rises above the lake like some colossal piece of scenery, located on a double hill with highest point at Samuel’s Fortress 800 m. above sea level. The Lake is 30 km long and its width varies from a maximum of 15 km, to an average of 11 km. Lake Ohrid has been found to be deepest 286 m., about 5 km from the shore, in the section between the fishing villages of Pestani and Trpejca. Its average depth is 151 m. The rare clarity of the water in Lake Ohrid whose translucency may reach down to depth of 22 meters, is due to numerous underwater springs all along the south and the east shores. Much of this water comes from Lake Prespa, which lies at a greater altitude. Complete your journey to Ohrid by visiting Galichica, the lovely mountain that keeps secrets for at least the next million years, as it was said by certain explorers. Due to its exceptional natural beauties and the rich endemic flora and fauna, in 1958 Galichica has been proclaimed a National park. 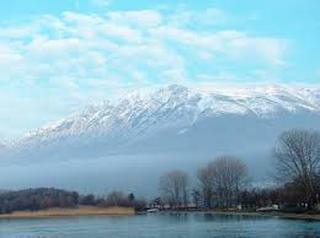 It is situated in the south-west of Macedonia, at the meeting point of the borders of Macedonia, Albania and Greece. Galichica is endowed with rare species of floral and animal wildlife.What you simply mustn’t miss are the springs of the river Crn Drim (Black Drim), located near the complex St. Naum, where you can offer yourself a ride on a small boat along the thirty subterranean and the fifteen coastal springs in amazing surroundings and have an unrepeatable adventure. On 1735 mетерс above the sea level the place called Vidikovec – Goga is situated, a position from where you can see the two lakes – Ohrid and Prespa Lake – at the same time. 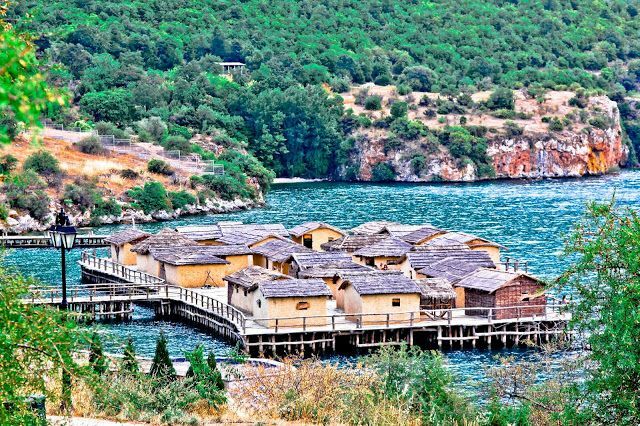 Ohrid is one of the most ancient human settlements in Europe, containing as it does Neolithic archaeological sites and others from the Bronze Age and the Hellenistic period. With its numerous prehistoric sites and its traces of the material culture of more than 5,000 years ago, Ohrid is indeed an archaeological treasury and the surroundings of the lake can be styled a magical land of archaeology. More than 250 archaeological sites with material remains dating from between the Neolithic period and the late Middle Ages have been excavated. The builders of Ohrid’s ancient theater have estimated very precisely where to put the building – in the center of the elevated old town. The open theater holds a perfect location, as the two hills (Gorni Saraj and Deboj) keep it protected from winds that could interfere with acoustics during performances.The Ancient theatre of Ohrid of the Hellenistic period was built in 200 BC and is the only Hellenistic-type theatre in the country as the other three in Scupi, Stobi and Heraclea Lyncestis are from Roman times. It is unclear how many people the original theater used to seat, as only the lower section still exists. Discovered accidentally and later excavated completely, this 4, 000 square meter monument to antique Greco-Roman culture is being used today during the annual Ohrid Summer Festival for performances of ancient tragedies and comedies. 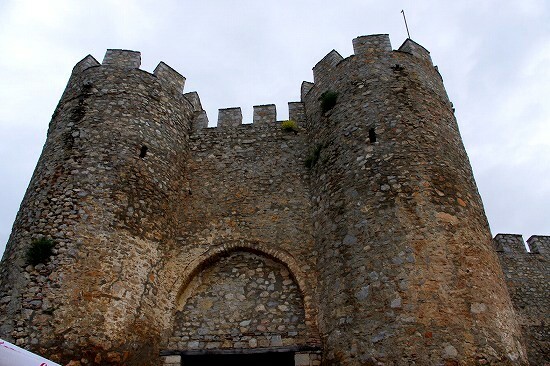 The Ohrid Fortress is one of the largest mediaeval fortifications to be preserved in the Republic of Macedonia. With its massive walls and ramparts, it occupies the entire summit of the hill of Ohrid. The hilly pert of the town was protected on all sides save the south, which faces the lake, by towers and high walls three kilometers in length, stretching as far as the harbor. Entrance to the town was gained by three gates, of which only the Upper Gate has been preserved. The Fortress, in addition to serving the function of defense against enemies, was also an inhabited area and has come to be known as Samuel’s Fortress. During the reign of Samuel (976 – 1014), and of his successors up to 1018, Ohrid was the capital of the first Macedonian Midevial state. Both before and after Samuel’s time and of his successors the fortress was destroyed and rebuilt again. After the transformation of Samuel’s state into a political and ecclesiastical seat, Ohrid became a real mediaeval metropolis. The town’s architecture represents, with its old typical streets and houses and its particular atmosphere around old squares, the best preserved and most complete ensemble of ancient urban architecture of this part of Europe. It takes a particular place in the cultural heritage as a result of which the particular type of the oriental city house built during the 18th, 19th and the beginning of the 20th century is protected more than in the other Macedonian cities. The folklore builders had built these houses under influence of the oriental and Byzantic building traditional. the great French architect La Corbises in his “Collection of works” dedicates particular attention to the Macedonian city house and its facades, balconies and interiors. On the road leading to Ohrid, in front of the very entrance to the city, stands a small, modest board bearing the inscription “Saint Erasmus”. It points to the eponymous 5th century three-nave basilica dedicated to this saint, who is one of the 14 saints-helpers in trouble. We learn about his life from two hagiographies dating from the 9th and 11th century and describing his coming to Lihnidos at the end of the 3rd century, carried on the wings of the angel who rescued him from Diocletian’s (284-305) tortures in Antioch. The angel led him out of the terrible darkness and took him to the City of Light, where he immediately started preaching the Gospel of Christ and performing numerous miracles: he restored sight to the blind, and healed those suffering from various illnesses. His cult has been well-kept in Ohrid since the time it was called the City of Light (Lihnidos). That is why he will forever remain known as St. Erasmus of Lihnidos. The church of St. Sofia is one of the largest medieval churches on this territory. For a long time it was the cathedral church of the Ohrid Archiepiscopate whose ecclesiastical authority covered the territories up to the river Danube to the north, the Albanian coast to the west, and the Bay of Thessalonica to the east. The fresco paintings in the church are among the highest achievements in medieval painting in Macedonia and wider. These are the most important preserved works of Byzantine monumental painting. 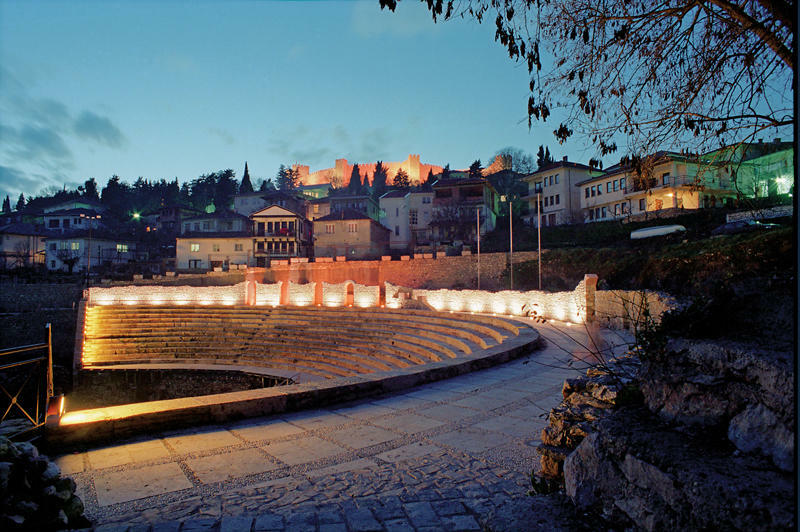 Within the very heart of the present city of Ohrid lies the antique city of Lichnid, significant and rich, as is its successor. 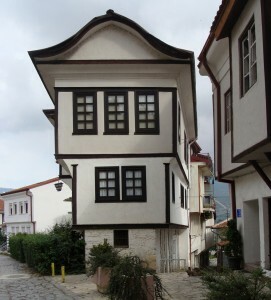 The metamorphosis of ancient Lichnid into medieval Ohrid took from the 6th to the 9th century, creating one of the most significant medieval cities in the Balkans. The Ohrid saga reveals memories of the birth of Slavic literacy and culture in the works of St Clement and St Naum; St Clement is worshiped as a patron of the city: his three decades of work in the city (886-916) initiated the foundation of the Clement Slavic University. 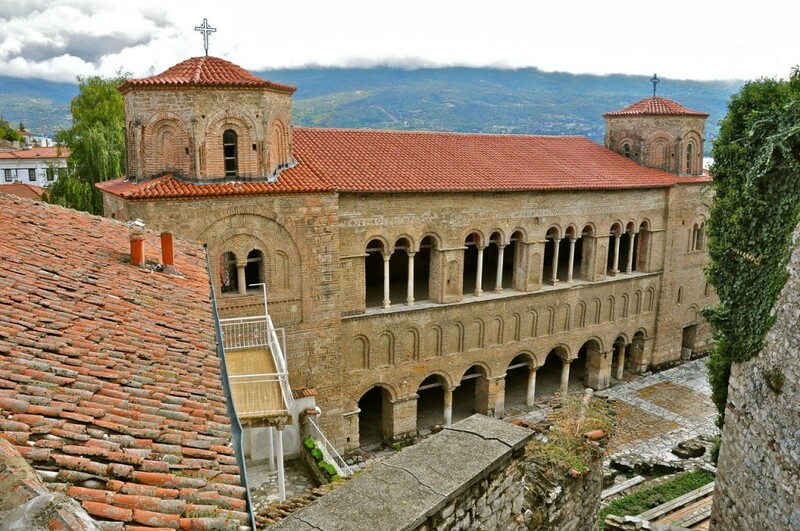 The ancient Slavic St Clement’s Monastery of St Panteleimon at Plaosnik was re-sanctified on 11 August 2002 when, after many years, the remains of St Clement of Ohrid, the first Slavic Bishop (893) and founder of the Macedonian Orthodox Church, were returned to this temple. As with most Byzantine churches, St. Naum was chosen primarily for its location – on a high, rocky outcropping over the lake, above deep forests and life-giving springs of the river Crn Drim. The monastic complex and church of St. Naum were built originally at the turn of the 10th century by the monk that bared the same name. Here he creates a monastic brotherhood, a literary school, and he utilizes his miraculous power to cure people, especially those suffering from spiritual illnesses. Macedonians believe you can still hear the saint’s heartbeat by pressing an ear to his stone coffin inside the church. The monastery has been renewed and enlarged several times over the centuries. According to the sources of the monastery, in 1662 there used to be a hospital, and two centuries later a linguistic center, where some of the most prominent representatives of the Macedonian literature, like Dimitar Miladinov, got their education (The church itself is of great importance for the linguistics because of the writings in Cyrillic and Glagolitic alphabet dating from the 10th till the 10th century, one of the oldest written evidences of the Slavic literacy). The people of Ohrid possess a special artistic spirit, and numerous crafts have been practiced here for centuries. Today these traditional skills, such as woodcarvings, silversmith, making jewelry (most famous are the Ohrid pearls), making products of copper, leather and handmade paper, and are still performed in much the original manner. The world renown Ohrid pearl is created from the scales of the little fish “Plašica”. The methods are secret family traditions passed on from one generation to another. Ohrid pearl necklaces, earrings, and broaches are popular souvenirs. The experts would tell you that this pearl lasts eternally.